The newest addition to our growing family of tiny and nearly invisible Xino RICs, Xino Classic is a sleek and sturdy RIC 312 that gives patients the technology they need and the control they want. Our Xino line is rounded out with our RIC 10, which is still our smallest hearing aid, offering a discreet option for patients with mild to severe hearing loss. Taking advantage of 3 Series’ open architecture, the BluWave 3.0 operating system provides the foundation to concurrently run other applications necessary to eliminate noisy artifacts while characterizing the frequency and intensity of input sources. By providing more accurate control of critical hearing aid parameters, BluWave 3.0 has enabled enhancements to many of our already leading performance features — giving 3 Series hearing aids the ability to more naturally eliminate feedback, deliver optimal performance in noise, and better manage power, telephone performance, directional hearing and data. Our newest version of our revolutionary noise reduction and speech preservation system, Voice iQ² applies variable noise adaptation faster than ever before, providing improved speech clarity, even in the noisiest environments. InVision Directionality³ has been enhanced to provide smooth and accurate transitions in every environment using dynamic directional switching. A smart solution for patients who have steeply sloping, high-frequency hearing loss, our new frequency lowering technology, Spectral iQ, is designed to enhance real-time audibility by intelligently identifying high-frequency speech cues, then replicating them in lower frequencies. 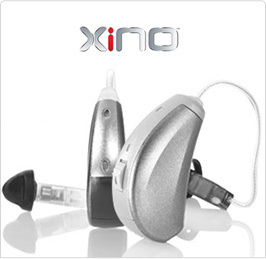 This allows Xino to maintain important frequency relationships, retaining the sound quality that comes from harmonic distribution while providing audibility for high-frequency speech cues for patients that may have previously been considered unaidable. A new initialization protocol provides a more natural approach to combat feedback, identifying, classifying and eliminating annoying whistling and buzzing in all environments. And with 28dB of added stable gain, patients experience feedback-free and comfortable listening no matter what they’re doing. We added advanced oleophobic properties to our HydraShield nanocoating to better protect Xino hearing aids from earwax and other oily substances. The result is HydraShield, a new oleophobic nanocoating that, combined with Xino’s unibody construction and smart component placement, makes them more reliable and durable than ever before.